ENO DoubleNest One Link Hammock Sleep System. A comprehensive outdoor system that allows you to set up in minutes, lie down for hours, and enjoy all that Mother Nature throws your way. You won’t miss a sunset, a sunrise, or go a moment without proper rest. ENO now offers the OneLink Sleeping System. 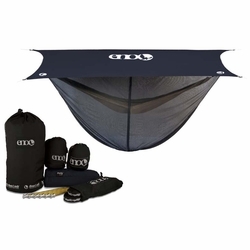 This comprehensive package includes a DoubleNest hammock, Atlas hammock suspension straps, Guardian BugNet, a rain tarp, as well as a set of Easton Aluminum Tubular Tent Stakes. NOTE: PLEASE SELECT THE DESIRED HAMMOCK COLOR AND RAIN FLY TYPE FROM THE OPTIONS MENU ABOVE.